[laughs] Those are kind of urban myths. Sure, I started working for those guys part time in the late Eighties, and my credo was that I’d do whatever needed to be done. And a lot of times when you’re in those situations you do all kinds of things. I think, somehow, through all the speculation on the internet, people started saying that I did all these strange jobs. But nothing was strange. I was just a go-getter that would do whatever task was at hand, which is normal if you wanna get somewhere in your life. I’m proof that persistence works. I’m stoked to have a signature guitar! It’s something I’ve dreamed about ever since I was a kid. I put my heart and soul into it and made it something I’m really proud of. I think it’s a great guitar and package, with the custom guitar strap and silver case. I started using it on our South American tour. I literally took one out of the box, and my guitar tech and I set it up. That goes to show the quality of the guitar: I can take it right out of the box and straight to the stage. Yes. [laughs] And we’ll leave it at that, okay? There are definitely parameters to the Kiss sound. And nobody can argue with that, because it’s something that’s been proven for 40 years now. Since I’ve been in the band, I’ve tried to be faithful and adhere to what made Kiss strong and powerful in the first place. But in doing Sonic Boom a few years ago, and now Monster, I’ve had the opportunity to spread my wings more. It’s always a balance between the two. You have to be faithful, but I need to show my colors, too. I don’t think Black ’N Blue was ever big enough to have super hefty residual checks. I do see some royalties, particularly the performance royalties. But as far as sales of the records, it’s bottomed out. It’s been a long time. I haven’t been in the band for 25 years. The first time was at a private corporate concert in Jamaica in early 2002. It was exhilarating and over the top, but also very comfortable. It didn’t seem that out of the ordinary. I had been around the band a long time, so I wasn’t new to the family. I’d also played in a Kiss tribute band in the early Nineties and we’d wear Kiss makeup. Actually, I even used to put on Kiss makeup as a kid. So it was more of a familiar feeling than not. It all came very naturally. But of course, you’re filling big shoes because there’s such a big legacy with Kiss. There’s high expectations and pressure to step up and do a great job. And yeah, some people say, “Why didn’t you come in and introduce a new character?” It’s an interesting question, but when I got in the band I was just honored to be there. I also respected where they came from and what they’re all about. So who am I to ever suggest I need a new personality or a new character, or the band needs a new guitar sound or style? That’s ridiculous. Sometimes it just takes people a long time to understand that. 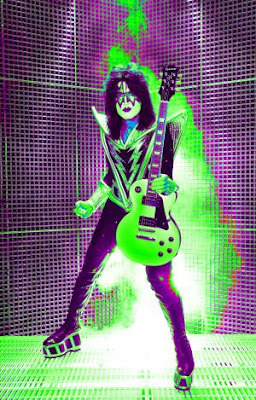 One of my favorite Kiss solos, and songs, is “Black Diamond.” I got the Kiss album for Christmas in 1974. I think those guitar solos, and a lot of the solos on the first four Kiss records, are quintessential rock and roll greatness. I tip my hat to Ace, because back then he did some amazing stuff. That’s a big part of why Kiss appealed to a lot of up-and-coming guitar players like myself. He did some stellar guitar work on the first album, Hotter than Hell, Dressed to Kill and Alive! [laughs] I have to say, with all due respect to all the great guitar players out there, I’m not really a shred fan. My roots are in the hard rock, English blues style that started with people like Jimmy Page, Eric Clapton and Jeff Beck. That’s more my thing and probably always will be. My favorite guitar players are the ones that not only write great solos but also write great riffs and great songs. If it doesn’t have that, I don’t put it in the highest standard. Yeah, replacing somebody as great as Ace is very challenging. But at the same time, I feel pretty good about what I’ve done, and I know the band does too. There’s always gonna be dissenters and critics. That’s just part of the job, especially with the advent of internet blogs. People have the propensity to get on and say all kinds of stuff. That’s just this day and age. Honestly, I look at a lot of that as a reflection of the people that are saying it. It’s more of an outlet for their unhappiness or frustrations in life. I know what I’m about, so I don’t have any doubts about what I do or who I am. That kind of community service and helping other people comes from my father and mother. That’s the kind of people they are, and it rubbed off on me. The basic concept of helping other people is an important part of our civic duty. I grew up in the Portland area, and I’m on the board of trustees for Pacific University up there. I help with their huge fundraiser called Legends. It’s a music, entertainment and golf event. Then there’s the royalties for my Hughes & Kettner [Tommy Thayer Signature Duotone] head, which go straight to the Childrens Hospital of Los Angeles. We always need to help the younger, less fortunate people to get a step up in life. It’s really important. Everyone in Kiss has always done their own makeup, including me. It’s a ritual for us all to sit down and do it before we go onstage. Kiss is one of the hardest-working bands in show biz. We get started in the middle of the afternoon with soundchecks and meet-and-greets. Then there’s the makeup process, which takes two or three hours. We’re working hard way before the show. It shows when we get onstage: you can see there’s something really special in what we do. I don’t have any complaints or reservations about wearing the outfit. It’s a distinct honor. Who wouldn’t love being lead guitarist in Kiss? There’s nothing I can say negative about it! I just love it. No, as a matter of fact, we decided not to do demos for Monster. We pretty much wrote all the songs organically: getting together at someone’s house or hotel room, if we were touring. We thought if we recorded all these good demos then we’d be fighting the demo-itis battle, where you’re trying to top the demo when you’re doing your master. We’d rather capture the true spirit and energy of the original.